Beyond The Orphan Train Series – just released on audio! Step back in time to May 1907 and meet the Cooper children – Ethan, Alice, Simon and Will as they begin a remarkable journey to find a new home and life in Arleta Richardson’s Beyond The Orphan Train Series. I so enjoyed narrating these heartwarming books for christianaudio and immediately fell in love with Richardson’s poignant writing and her wonderfully rich characters. Based on the real life story of Ethan Cooper, this series takes place during the early 1900’s where eight year old Ethan and his younger sister and brothers find themselves suddenly on their own. They journey to an orphanage in Pennsylvania called Briarlane Christian Children’s Home, and soon after, continue on with 21 other children in search of a new life aboard the Orphan Train. Orphan Trains were in operation between the years 1824 and 1929 and carried approximately 250,000 children who were either orphaned, homeless or abandoned. The trains would make stops in small mid-western farming communities along the way, in the hopes that a loving family would take one or more of these children in. 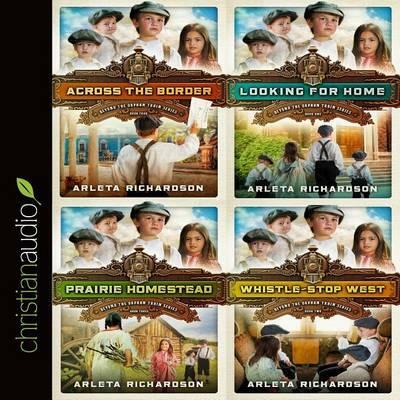 Looking For Home, Whistle-Stop West, Prairie Homestead and Across The Border are now available on Audible, Amazon and at christianaudio. This entry was posted in Audio Books, Narration, News, Press and tagged Orphan Train; 1900s; Arleta Richardson; christianaudio; Susan Hanfield; Ethan Cooper; Christian; Children's Books. Bookmark the permalink.